My dog journey started with Jessie, a small white fluffball bichon-schnauzer cross. She was trained in the traditional way by choke collar and verbal praise. After she died, Giro, my Smooth Collie, taught me how wrong this approach was, and introduced me to the fascinating world of positive dog training. 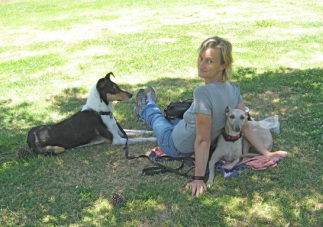 Kiara, my Whippet, reaped all the benefits, and can't wait for her training every day, all day! I have completed the Delta Society's Certificate IV in Dog Behaviour & Training, and am a member of the Pet Professional Guild. My biggest role models in dog training are Leslie McDevitt and Susan Garrett, but many others have influenced my approach and thinking. I have volunteered at the RSPCA, where I worked with the dogs who needed help with their training and behaviour to improve their chances of being adopted. It was immensely rewarding, but sometimes heart-breaking work. Through DeltaDogz, I hope to be able to help as many dogs and their people as possible to find out about the fascinating and rewarding world of positive dog training. A gorgeous boy, he has presented me with many challenges along the way. I am forever grateful to him for not accepting my "dominance" based approach, and to his breeder for pointing me in the right direction, culminating in me ditching my corporate IT job, and becoming a professional dog trainer and behaviour consultant instead. This lovely girl is a joy to train and hang out with. She was my first "properly" positively trained dog from when she was a puppy, and it shows! We are very lucky to have her in our life. Her high-speed recall has made her the star of our local off-leash park!